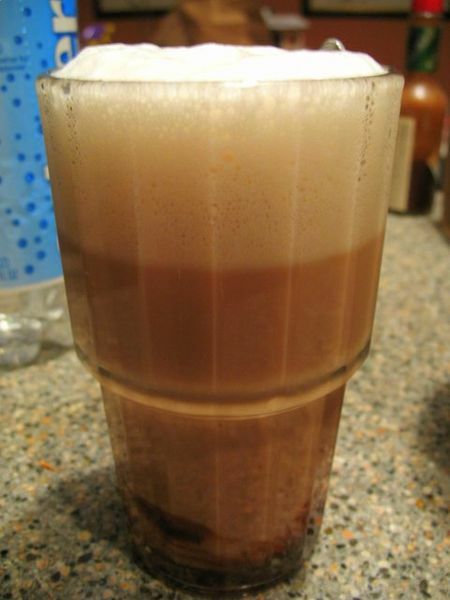 An egg cream is a classic beverage consisting of chocolate syrup, milk, and seltzer, probably dating from the late 19th century, and is especially associated with Brooklyn, home of its alleged inventor, candy store owner Louis Auster. It contains neither eggs nor cream. Left: A New York Egg Cream. 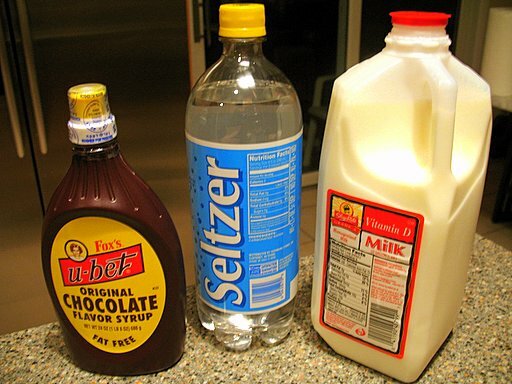 The egg cream is almost exclusively a fountain drink; although there have been several attempts to bottle it, none has been wholly successful, as its fresh taste and characteristic head requires mixing of the ingredients just before drinking. The drink can be compared to a traditional ice cream soda, though it contains no ice cream. Because a traditional egg cream relied upon seltzer under high pressure being delivered via a siphon nozzle rather than poured from a bottle, modern preparation has been slightly altered to preserve the traditional layer effect. Pour one part very cold whole milk, optionally froth with handheld Aerolatte-style frother or equivalent. Pour two or three parts seltzer from a just-opened bottle, add a quarter to half-inch of chocolate syrup, and froth just a second or two at the very bottom to mix, preserving distinct layers.